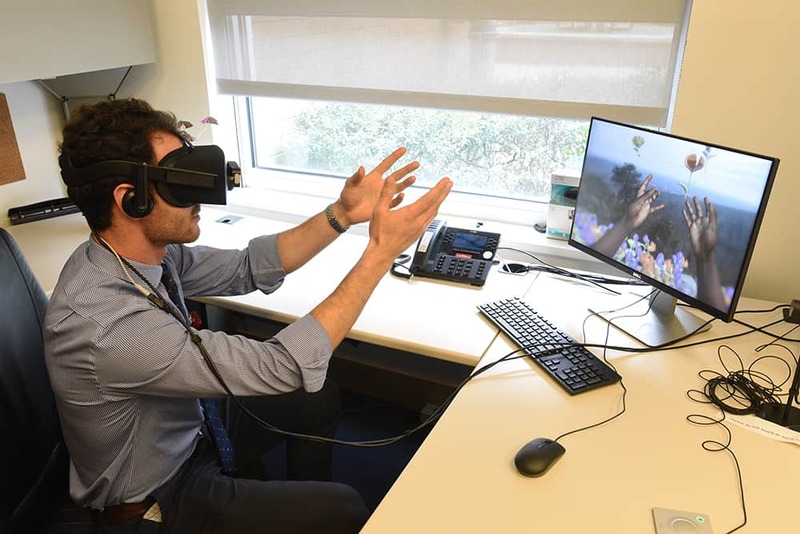 Using virtual reality technology, Nathan King experiences a simulation of vision and hearing loss. March 18, 2019 | Nathan King was experiencing hearing loss and the blurred vision that comes with macular degeneration even though his eyes and ears were just fine. Through a computer simulation, King, an education coordinator in the new UAMS Institute for Digital Health & Innovation, was learning what the challenges are for older adults who live with these conditions including memory loss. Priya Mendiratta, left, Dirk Reiners, Mark Jansen, Curtis Lowery and Jeanne Wei with a ribbon-cutting celebrate the start of two new educational initiatives at UAMS. King was taking part in a demonstration of virtual reality during a ribbon-cutting celebration for the start of initiatives involving that technology and for a new telemedicine collaboration between the Institute for Digital Health, the UAMS Donald W. Reynolds Institute on Aging and UAMS Regional Campuses. Virtual reality uses a three-dimensional computer simulation of an environment. The user wears goggles with a screen inside and can interact with what is happening on the computer screen. For King, this meant during the simulation there was a dark splotch in the center of what he was seeing. He could also hear people talking in the simulation, but their voices were muffled and hard to make out. Telemedicine is the diagnosis and treatment of patients in a location apart from where the doctor is by using telecommunications technology — usually live, high-definition video. The same technology can be used for medical and professional education. Led by the Institute on Aging’s Priya Mendiratta, M.D., UAMS has begun using telemedicine to train residents at the university’s regional campuses in geriatrics. 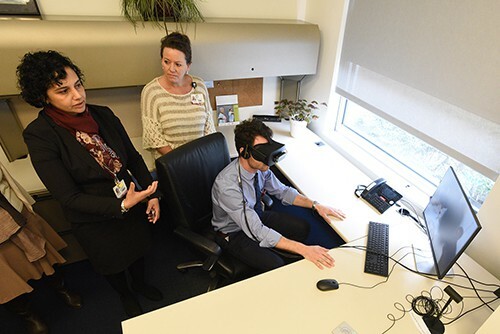 On the main campus of UAMS, about 300 learners a year also will be able to learn through the virtual reality technology and simulations at the Institute on Aging about what people experience with dementia, hearing loss, vision loss, macular degeneration and end of life discussions. Those learners include residents, medical students, research fellows and faculty. Dirk Reiners, Ph.D., associate professor of Information Science at the University of Arkansas at Little Rock and chief scientist of the Emerging Analytics Center, was instrumental in helping set up the virtual reality technology at UAMS in collaboration with Embodied Labs of Los Angeles. A small grant from the Arkansas Medical Society also helped offset some of the cost of starting the program. The simulations of dementia enable the user to experience that state of mind from its early to its moderate and advanced stages. Mendiratta, left, and Marcia Byers watch King as he begins using a virtual reality simulation. The telemedicine initiative, using technical expertise and technology from the Institute for Digital Health, will teach family medicine residents and other learners at UAMS Regional Campuses about dementia and other aging-related conditions in older adults. Mendiratta has already experienced firsthand the value telemedicine instruction can bring to nursing homes and the patients there. Off and on for a few years, she and Curtis Lowery, M.D., director of the Institute for Digital Health, have discussed the role telemedicine might play in nursing homes. With support from Wei, Lowery and Tina Benton, R.N., chief operating officer of the Institute for Digital Health, they started a one-year pilot study last year with a nursing home in Clinton. Via a live, high-speed video connection, Mendiratta and her team met with patients, nurses and other health care providers there about best practices. Mendiratta said she hopes to expand on this success and to use the telemedicine network to collaborate with more nursing homes around Arkansas.